Michael is a board certified and licensed Physician Assistant who specializes in the clinical and surgical management of hip and knee disorders. In particular, he works extensively with hip and knee arthroplasty patients under the guidance of Dr. Dalury. He assists with surgeries at University of Maryland St. Josephs Medical Center and sees patients at the Bellona Office. Michael graduated from the University of Maryland, College Park with a Bachelor’s Degree in Kinesiolgocial Science. A lifelong athlete, Michael has utilized his passion for human movement and performance by working in the Strength and Conditioning industry including a stint with the Baltimore Ravens. His work with athletes fueled him to learn more about the human body and propelled him to return to school to further his knowledge. 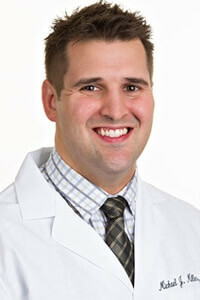 He subsequently graduated from Towson University with a Master’s Degree in Physician Assistant Studies. Michael is a member of the American Association of Physician Assistants and the Maryland Association of Physician Assistants. Michael lives in Howard County, Maryland with his wife, two kids and two dogs.